I wrote about “AI Crossover” some months ago after reading Jeff Clune’s paper. Since then we’ve had the Second Frontier Development Lab with NASA & the SETI Institute, which included Adam Cobb, a PhD student in Machine Learning at the University of Oxford, who has carried out work tracking lion footprints with artificial intelligence [paper]. I am writing this from my hotel room in Venice where I’m attending the International Conference on Computer Vision and, to my surprise, Samasource are sponsoring. Many years ago, when they first launched, I had contacted Sama about their work in Kibera, providing digital work to Kenyans. I am truly happy to say Leila Janah’s company has grown massively, with support from Google, Walmart, ebay, Microsoft, Glassdoor & others. They are still lifting people out of poverty by connecting them to dignified digital work but now of course the AI Revolution has created a huge demand for labelled data & as a result Sama have employed more than 8,000 people in Kenya, Uganda, India, and Haiti. Enrich your data and fight poverty. Especially now, when Kenyans are struggling with failed crops and dead livestock, due to the ongoing drought. 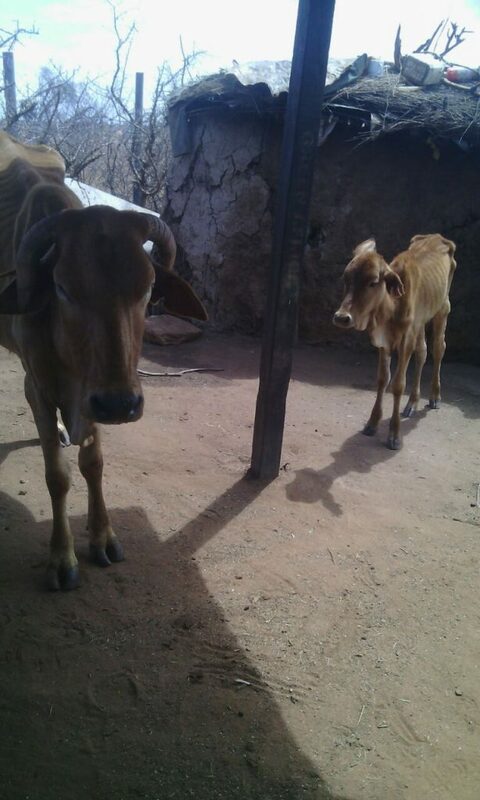 The photo below was taken yesterday by our maasai friends of 2 of their remaining herd, both too weak to move. When they lie down, the maasai cannot get them back up again in this state. On average, people earn $2.20/day prior to joining Samasource. Sama has pioneered the field of impact sourcing, hiring people out of poverty, providing training & support in digital literacy, and secure employment. AVIF works with another great organisation that serves the millions of people living in Kibera. Led by the incredible Liz Odera, Sadili helps via sport but they also have land and buildings on the edge of the slum where they can host training. I have already connected the 2 organisations and hope to see coding schools and digital work training for many more local Kenyans. Please support them. Email: kenyainfo@samaschool.org or Click here to apply. Kibera Town Centre (formerly the Human Needs Project), Kamukunji Grounds, Kibera 0728 437 802 Location or Click here to apply. Do not hesitate to contact us with further info.